Back in 2009 I published this. I posted my Sony a850 off, finally, to its new owner a few hours ago and for the first time in my serious photographic life I have no (D)SLR. It was a close run thing. Right up to the last moment I almost bottled out and kept the Sony. What if Vogue phone up? How can I be a professional photographer any more? I don't have a big camera. Thoughts like this kept running through my head. The fact that I can be at my local Jessops with a credit card in less than 15 minutes, didn't seem to register! It does feel strange, I will admit that. I definitely have the sense that something is missing. So what do I have left. Leica M9 50mm Zeiss T* Planar. One lens, no dust spots, amazing quality. Fuji X100. Great quality. Wonderful Viewfinder. My low light camera. 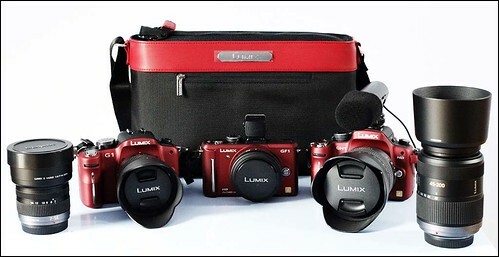 Panasonic GH2 and Olympus E-PL2. Panasonic 7-14mm Zoom. Olympus 14-150mm Zoom. Panasonic 20mm f/1.7, Panasonic Leica 45mm f/2.8 Macro. My "Pro" outfit. Its what I've wanted to do for a long time, and I've decided its time to try it. The X100 filled in so many pieces of my "gear jigsaw". A small, light camera thats great in low light was something I've been looking for for ages. It's not perfect, but it works for me. There are (were) a couple of DSLR's I might (have) been interested in. The Sigma SD-1 was one but at £6200 I think I'll pass! The other is the Sony A77. I'd like to think I will go with whats above but there's still that little nagging voice that says "You're not a real photographer without a DSLR" I'll see if it persists or fades away.